Let’s take a look at what’s going on in the Smith & Nephew Hip Implant MDL this month. It may surprise you to see what is happening to very good products liability cases in this MDL because all the necessary parties have not been sued. The total hip replacement surgery (“THR”)3 cases in this hip implant MDL are unusual because they all involve cases where the implanting surgeon is never sued, but the surgeon always ignored the obvious fact that the implanted parts were not intended for use together. You cannot have a THR case in this MDL unless your surgeon ignored very obvious limitations on the intended use for the implanted products. You also cannot sue the careless surgeon in this MDL even though he or she failed to inform you that the implanted parts were not FDA-approved. The idea of not suing a careless surgeon in an implantable device case has always presented a logical problem for me, and that is why the cases I file involving Smith & Nephew THR cases almost always include the surgeon, the Smith & Nephew sales reps, and Smith & Nephew. There are three types of Smith & Nephew hip implant cases pending in front of Federal Judge Catherine C. Blake in Baltimore, Maryland. The largest group of cases involve a type of hip resurfacing device known as the “Birmingham Hip Resurfacing System” (BHR). There are also two types of THR devices that don’t have product names because they were never approved for sale in this country. As of yesterday’s weekly update to Judge Blake, there are currently 371 BHR cases pending against Smith & Nephew in the consolidated Federal Court proceedings known as MDL-2775. There are also 147 cases involving the no-name THR cases. The BHR cases involve an FDA-Approved device system, and those cases present all the usual legal issues that face any Court trying to decide if there’s a possible products liability case despite FDA Approval. A manufacturer of an FDA-Approved device enjoys numerous protections from products liability cases, and the legal hurdles that must be overcome to make a valid case against a manufacturer of an approved device are well-known and familiar to medical device lawyers. Judge Blake has already outlined the contours of the BHR cases in her Order granting in part and denying in part Smith & Nephew’s Motion to Dismiss issued on March 26, 2018. She dismissed many of the Plaintiffs’ claims due to Federal Preemption,4 and the manufacturing defect claims were dismissed for failure to state a claim, but most of the other claims survived the Motion to Dismiss and will proceed to the discovery phase, involving the production of documents and depositions of company witnesses. There is a tentative trial scheduled for March of 2020 involving some of the BHR cases. Again, the comments in this blog only apply to the THR cases targeted for dismissal at the upcoming January 30 hearing. II. Why Are the No-Name THR Cases So Unique? The THR cases, on the other hand, are a more recent addition to the MDL, and are just beginning to get the Judge’s full attention. This month, the Court will hear arguments on Smith & Nephew’s Motion to Dismiss the THR cases.5 Smith & Nephew is asking the Judge to dismiss all the THR cases based on Federal Preemption, and it is likely the Court will trim some of the Plaintiffs’ claims just like she did with the BHR cases. What strikes me about this round of Motions, Briefs, and arguments is the fact that all of the THR cases involve surgeries where the surgeon absolutely had to know that the metal parts he or she was implanting in the patient were not FDA-Approved or FDA-Cleared for a THR surgery at all. Unlike the other MDLs against other metal hip implant manufacturers, the Smith & Nephew MDL is unique because it involves cases that would not even exist if the surgeons had simply used the parts as they were intended. The two types of THR cases targeted for dismissal this month both involve combinations of metal parts that are clearly sold for different surgeries than the 147 Plaintiffs in MDL-2775 underwent. This fact cannot be ignored, but nearly 150 people nationwide have already filed THR cases in the MDL without suing the surgeon who was in the O.R. when the unapproved parts were implanted. In many cases, the Smith & Nephew sales rep was right there helping with the surgery.6 In my opinion, a products liability lawsuit filed against the surgeon, sales rep, and Smith & Nephew is much stronger and more difficult to defeat than one where the only party sued is the manufacturer. PREDICTION. I predict a vigorous courtroom debate in Baltimore on January 30, but I think the Judge will probably trim some of the Plaintiffs’ claims against Smith & Nephew. I also predict there will be fewer THR cases filed in Federal Court after the MDL Court rules on the Motion to Dismiss a few months from now. That’s because more people will see the importance of suing the commission-based sales rep and careless surgeon who used unapproved parts without informing the patient. Every person with a THR case in the MDL will eventually have to accept the fact that their surgeon ignored the obvious fact that the parts used were not approved or intended for the very surgery they are suing the company for. It will be part of Smith & Nephew’s defense, and it will present a problem in all cases where the surgeon is not sued. This is especially true when the company told the surgeon the product was not FDA-approved, and many surgeons were directly told that—in writing. The Smith & Nephew THR cases were part of a medical experiment that failed when many of their unapproved parts had to be surgically revised and partly replaced a few years after implantation. Their products liability cases are now part of a legal experiment where the injured patients are trying to hold a company liable for parts that failed to work when they were used in ways that are inconsistent with the manufacturer’s clearly stated intended use.7 Smith & Nephew has raised many defenses already, and refusing to sue the implanting surgeon and sales reps just makes it easier for them to continue defending these cases. To view this article in PDF format, please view the PDF version here. 1. The term, “MDL” means, “Multi District Litigation.” Three types of Smith & Nephew cases in Federal Court have all been sent to one “MDL” Judge in Baltimore, Maryland. 2. The comments below only apply to the total hip replacement (“THR”) cases and do not apply to any of the “Birmingham Hip Resurfacing (“BHR”) cases. 3. 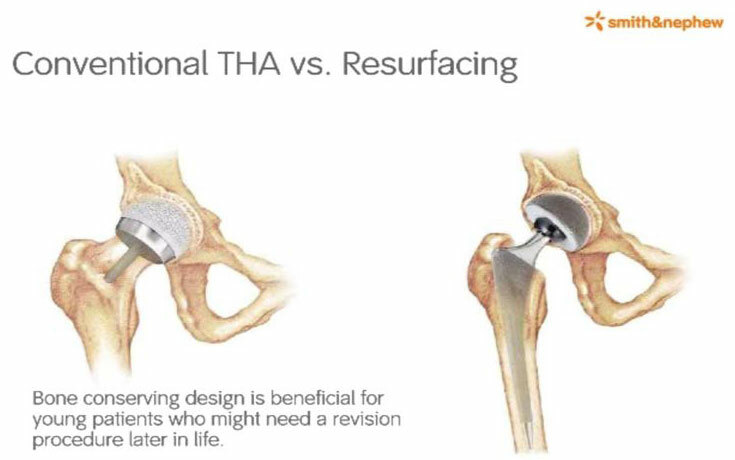 A THR is a hip replacement procedure where both the hip socket and the human femur are replaced with prosthetics, including a metal femoral stem, metal or ceramic femoral head, and metal or ceramic acetabular cup. Often, the THR also includes a liner—metal or polyethylene—between the femoral head and acetabular cup. 4. “Federal Preemption” is a legal doctrine that exempts manufacturers of FDA approved products from most products liability lawsuits. 5. Smith & Nephew’s Motion, like all legal documents discussed in this Blog, are available on my website at https://www.kippetroff.com/smith-and-nephew-hip-implant-legal-information/. 6. The sales rep in the cases I have filed were commission-based salesmen who knew the parts were not approved, but the sales rep looked the other way rather than reminding the surgeon that a THR surgery was an unintended use of the parts. The Law Office of Kip Petroff announced today that Kip Petroff will be speaking at an upcoming “MDL Mass Torts” seminar in Napa, California. The seminar, entitled, “MDL Conference: The Mass Tort Litigation Landscape—A Critical Analysis” is held the day before the MDL Court hearing in Napa this week. Kip Petroff was quoted saying, “As I predicted in May when I spoke at the Chicago MDL [multidistrict litigation] conference, Smith & Nephew metal-on-metal total hip arthroplasties involving the R3 Metal Liner or Modular Femoral Head have been added to the Birmingham Hip Resurfacing (“BHR”) MDL. This makes the BHR MDL a unique litigation because of the many challenges it presents to plaintiff’s lawyers. I touch on these issues this week at the HarrisMartin’s MDL Conference in Napa, California. This paper and my brief presentation at the HarrisMartin MDL Conference seminar on September 26, 2018 will discuss an unusual type of products liability personal injury mass tort because, unlike most of the cases discussed here, new hip implant cases and new hip implant MDLs just keep on coming. The physical materials and surgical procedures used in hip arthroplasties are constantly changing, and new shapes, styles, instruments, pegs, sheaths, finishes, adapters, guides, and accessories are still appearing on hospital shelves at a dizzying pace. But one thing remains unchanged: the “mass tort landscape” has included hip implant cases in one form or another for several years, and there’s no end in sight. This paper will provide a broad historical overview of recent hip litigation in courts throughout the country. I’ll discuss what many of you already know, such as where the hip implant MDLs are and what products are involved. I’ll also provide some practical suggestions based on having personally (1) tried a Zimmer hip case to a jury last year, (2) argued a federal court appeal involving Smith & Nephew hips, (3) watched an entire ten-week Team Lanier hip implant trial against J & J, (4) read hundreds of thousands of “confidential” hip implant documents, and (5) taken almost twenty Zimmer and Smith & Nephew hip implant depositions—so far. For those who are future-oriented but don’t have a crystal ball, I’ll even tell you how to predict where the next hip implant mass torts might be in the future. It is not surprising that there is, and will continue to be, hip implant litigation in this country. 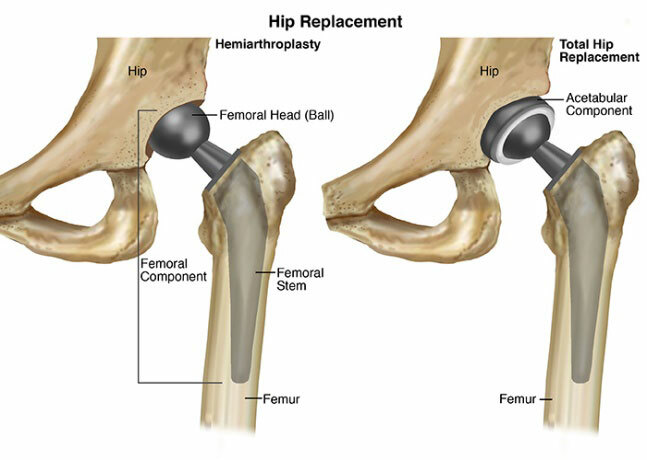 The hip replacement procedure has been successfully performed on millions of Americans since the earliest procedures were performed using metal-on-metal Charnley Hips in the early 1970s—before metal debris concerns led to a transition to metal-on-plastic in the mid-1970s.2 The procedure is considered one of the most successful and life-changing procedures in America today, and its usage nationwide will continue to increase as we all live longer due to other medical advances. But the ceaseless competitive desire of medical device companies to rush to market with “the latest and greatest” products and procedures for this ever-growing population ensures that mistakes will be made, and hip implant litigation will undoubtedly continue. This paper focuses on so-called “metal-on-metal” cases, because that’s where the cases are today. But the discussion below and the “three-legged stool” analogy applies to almost any implantable medical device products liability case. Metal-on-metal total hip arthroplasties have been around since before the Medical Device Amendments of 1976 to the Food Drug and Cosmetics Act. They were classified as “Class III” medical devices in 1987.3 Unless there is a substantially equivalent predicate device (making clearance through 510(k) possible), a Class III device must be cleared through the slower, more expensive Premarket Approval (“PMA”) process. Interest in the metal-on-metal total hip replacement procedure waned and then resurged in the late twentieth century, leading to a device classification panel meeting in mid-2001.4 That’s when the FDA Orthopaedic and Rehabilitation Devices Panel held a public meeting on the possible reclassification of metal-on-metal hip devices to Class II. At this meeting, the Orthopaedic Surgical Manufacturers Association (the representative for the medical device manufacturers) asserted that “sufficient information now exists to support the conclusion that the risks from metal-on-metal hips are no greater than those for metal-polyethylene hip prostheses.”5 However, the panel members had many concerns 6 and ultimately voted 5-2 to keep metal-on-metal devices in Class III, which meant that any new metal-on-metal devices must first clear the 510(k) clearance (if a substantially equivalent, cleared predicate device already exists) or PMA process. In mid-2012, the Orthopaedic and Rehabilitation Devices Panel held a two-day meeting to review metal-on-metal hips.13 By this time, hundreds of 510(k) premarket notifications for metal-on-metal total hip systems had been filed, and 188 of them had been cleared by the FDA (although many of these 510(k)s were for the same “systems”).14 The Orthopaedic and Rehabilitation Devices Panel’s goals included reviewing data on metal-on-metal hip systems, describing “potential and real safety risks,” and generating recommendations on how to “best communicate and mitigate risks.”15 The Panel ultimately noted that there were still “questions about the interpretation of imaging and ion testing results, questions about the performance of [metal-on-metal] devices relative to therapeutic alternatives, and . . . the need for some prospective longitudinal, randomized controlled studies to fill in some of these gaps.”16 By this time, the medical community had given up on metal-on-metal hip implants, and almost no one in America was still using them for total hip replacements. The metal-on-metal technology that received great fanfare in the mid-2000s was abandoned before the FDA finally got around to issuing new regulations less than a decade later. This regulatory scrutiny over a then-abandoned technology culminated in a proposed FDA rule in 201317 requiring PMAs for all metal-on-metal hips and calling a meeting of a device classification panel for that same purpose. This rule was finalized and adopted in 2016 and required “a PMA . . . to be filed on or before May 18, 2016, for any of these preamendment class III devices that were in commercial distribution before May 28, 1976, or that has been found by FDA to be substantially equivalent to such a device.”18 This meant that every metal-on-metal system in America would need medical proof of safety and effectiveness after May 18, 2016. More importantly, should a device’s PMA application be denied, the device is immediately considered “adulterated.”19 Adulterated devices cannot be placed into the stream of commerce, and doing so exposes both the distributor and seller to serious financial and criminal sanctions both at the state and federal level. These regulatory proceedings were the beginning of the end for metal-on-metal total hip replacements in America. Manufacturers stopped selling the devices and surgeons stopped prescribing them, but hundreds of thousands of people were implanted with this dubious combination of metal parts before the authorities could catch up with them. Given both metal-on-metal’s high failure rate and the fact that over a million Americans received such an implant, metal-on-metal revisions are likely still being performed daily.20 A firestorm of litigation began long before the FDA finally placed stringent regulations on metal-on-metal hip implants. This paper will briefly discuss that litigation. My main emphasis will be on Smith & Nephew metal-on-metal hip implant litigation because I can’t cover everything and because the Smith & Nephew MDL is one of the most active and rapidly-growing hip implant MDLs in America today. It is also one of the more problematic of the MDLs for the reasons discussed below. There are three “tracks” in the Smith & Nephew MDL: (1) the Birmingham Hip Resurfacing, a single device system entirely approved through PMA-approval; (2) the R3 track, which is a “traditional” total hip that includes the R3 Metal Liner (which was, confusingly, approved as a supplement to the Birmingham Hip Resurfacing PMA only for use in total hip resurfacings and not in “traditional” total hip arthroplasties), and; (3) the Modular Femoral Head hips, which involve the 510(k)-cleared Modular Femoral Head (cleared for use in hemiarthroplasties, where the femoral head articulates against the natural hip socket) and either an R3 Acetabular Shell or BHR Acetabular Shell (Tracks 2 and 3 will be collectively referred to as “S&N THAs”). Smith & Nephew THAs are metal-on-metal and unquestionably “off-label,” unapproved uses. Your client’s surgeon used at least two metal parts that were very obviously not approved or intended for use together. Your client’s surgeon was not sued for using at least two metal parts that were very obviously not approved or intended for use together. A plaintiff with a S&N THA case is always a plaintiff whose surgeon ignored explicit statements from the manufacturer about how and where to use the parts that were implanted. There are, of course, exceptions to these requirements, but they are very rare. 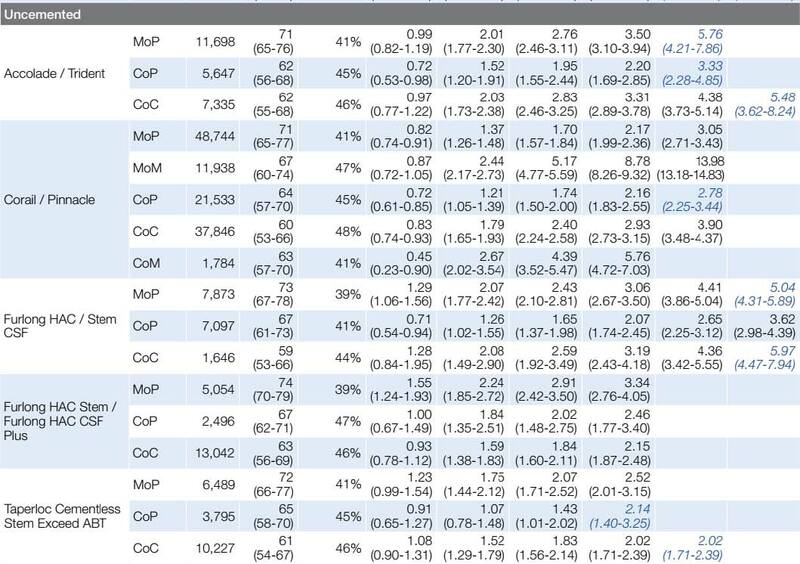 It looks like all the 100+ total hip replacement cases currently in the Smith & Nephew MDL meet the above two criteria. Some of the cases in the Smith & Nephew MDL even involve situations where the above two factors are met and the implanting surgeon was told in writing before the surgery that the metal parts used were not FDA-approved for use together. Some lawyers would agree that filing a case in an MDL under such circumstances is just too risky. The strategy of not suing a surgeon who carelessly disregarded obvious lack of FDA approval for a medical device is, in my opinion, too risky. Products liability cases are expensive and time-consuming to prove under the best of circumstances, but the risk of not suing negligent doctors and uncaring, dishonest sales representatives is simply too high for me. An individual lawyer’s ability to fight for his or her client with products involved in the older MDLs is limited because discovery about the company’s conduct is already completed in most of them. However, there are still opportunities to undertake discovery in cases outside the MDLs. Just last year, I tried a Zimmer case that was not in an MDL and the appeal I argued against Smith & Nephew in the Eleventh Circuit involved a case that had been dismissed before the Smith & Nephew MDL even existed. For the reasons discussed below, lawyers involved in these cases should consider alternatives to the MDLs when possible. The remainder of this paper will discuss some considerations that might help you decide whether to accept a hip implant case and where to file it if you end up getting that far. I will use the Smith & Nephew MDL as an example of the ways in which I am developing cases outside the MDL and why I am doing that in the Smith & Nephew cases. The analysis I am using for the Smith & Nephew hip implant cases applies to, and is useful in, any case involving injuries from implantable medical devices. I believe that too many cases are filed in MDLs without seriously considering alternative venues and litigation options. Filing in an MDL that involves devices that were granted FDA clearance for marketing and used that way is one thing, but do you really want to file your case in an MDL if the product was used in an off-label or unapproved way? What about the sales representative who mislead the surgeon and what about the surgeon who used the product in ways that were inconsistent with the manufacturer’s written instructions for use and package inserts? You may eventually have to prove your allegations against the manufacturer you sued in an MDL, and failing to include the sales representatives and surgeons who disregarded instructions for use can be very troubling when it comes time for proof of defect. Many lawyers sign up a client with a metal-on-metal claim and immediately join the MDL. Many lawyers won’t even take a “one-off” case if there is no MDL involving that device. However, other lawyers will take a case if the product was recalled for safety reasons—even in the absence of an MDL. I tried such a case in federal court against Zimmer last year, but it involved an FDA-cleared device and there were no issues about the surgeon’s unapproved, off-label use. On the other hand, I took depositions and obtained documents in several Smith & Nephew cases in state and federal court for almost two years before the MDL was formed. I have seen documents that clearly show what the surgeons were told about Smith & Nephew products, and this information makes me very hesitant to file Smith & Nephew cases without including the surgeon and sales representative as defendants. A brief description of the Smith & Nephew BHR MDL22 will explain why I believe in this approach. The Smith & Nephew MDL, first established in April 2017, is one of the newest, quickest-moving, and smallest hip implant MDLs. Since then, Judge Catherine C. Blake has already denied (in part) the defendant’s motion to dismiss in the hip resurfacing cases, and the parties are now proceeding towards discovery. In contrast, the larger DePuy Pinnacle MDL, filed in mid-2011, is still ongoing.23 Part of why avoiding these MDLs is useful is because it allows you to explore who knew what, and when, on your own terms. More likely than not, if a device subject to an MDL was widely-used, it will follow similar timelines to these two litigations. When that happens, everything slows down: trial settings are later, discovery takes longer, and your motions might not even be “your” motions anymore. The BHR MDL is unique because it illustrates the biggest challenge of MDLs: they forcibly create and exacerbate the “empty chair” problem. When litigating medical device products liability cases, the empty chair is a three-legged stool. 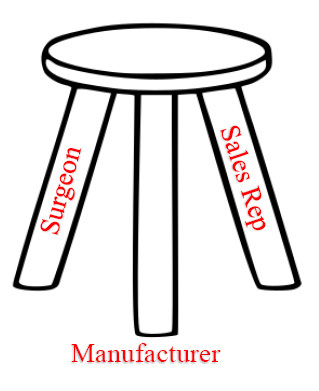 One leg is the manufacturer, the second the sales representative, and the third is the doctor. If any one leg of the stool is absent, the empty chair becomes unstable. If two are gone, it will almost certainly topple. The BHR MDL is a fascinating case study in the empty chair problem because, to be a total hip plaintiff in that MDL, the doctor had to have played a much larger role in the underlying claim than for most other devices. In fact, one cannot even have a total hip replacement case in the Smith & Nephew MDL case unless the surgeon used the components in ways that are drastically inconsistent with the written instructions both on and in the boxes containing them. By definition, surgeons and local sales representatives are not part of the MDL, but their role in choosing and implanting these dangerous, U.K-sold but U.S.-uncleared devices makes them the perfect scapegoat. Holding the manufacturer liable is a challenge when the manufacturer can prove that the doctor and sales representative had to both look at, and then ignore, instructions like the ones on the packaging below. However, by bringing the surgeon in to the case, you both fill the empty chair and create a new avenue through which you can solidify the other two legs of the stool: the manufacturer and the sales representative. Plaintiffs in other MDLs have avoided dismissal because of what sales representatives told the patient’s doctor, but that will usually not work in Smith & Nephew cases because the sales representatives are “independent” and have a contract with Smith & Nephew that makes off-label promotion explicitly improper. These statements are from an MDL that did not involve surgeons, but the products were FDA-cleared and widely promoted. Not so with the S&N THAs. In fact, the FDA specifically rejected multiple Smith & Nephew 510(k) submissions seeking to promote these parts for total hip replacements.26 The only written statements that accompanied the parts used in S&N THA cases noted that the products were not intended for use in such procedures. Without the surgeon in an off-label use case, only two legs remain. Although coexistent, the manufacturer and the sales representative cannot be combined, and the sales representative is often overlooked (and excluded) in litigation like this. With the BHR MDL, the sales representatives were typically “independent contractors” with shell companies and lengthy sales representative agreements. On paper, they were beyond the control of the manufacturer. In reality, they regularly conferred with their superiors and company executives, strategizing what products they plan to talk up to which surgeons. The surgeons and sales representatives are integral to proving liability in the context of the BHR MDL, and leaving them out of the case is an unnecessary gamble, in my opinion. Without a doubt, the most important leg of our three-legged stool analogy is still usually the manufacturer themselves.27 Their significance doesn’t need explanation, but an understated benefit they bring is that they can help show you exactly what third parties knew about their devices. What the FDA knew about a device, gleaned from the publicly-available 510(k) or PMA records, can go a long way towards constructing both a timeline and liability list for a device. Although “Fraud on the FDA” is not actionable under federal law, the regulatory history of a device is a powerful tool in highlighting differences in how the manufacturer portrayed the intended uses, indications for use, and safety of the device to the FDA and to doctors, patients, and the public. The bad news? There is extensive evidence that Smith & Nephew explicitly informed many surgeons in writing and informed all their sales representatives that none of the Smith & Nephew metal parts were approved or intended for use in a metal-on-metal hip construct. That evidence is too strong for me to take a case without doing everything I can to include the surgeons and sales representatives who totally ignored the clear evidence that confronted them before they used these parts together in surgery. The source of most of your discovery will be the doctor and the manufacturer, who is totally content to let these cases slowly develop in an MDL without surgeons or sales representatives. However, if you can stay in state court, you have access to much, much more discovery. Although the DePuy Pinnacle plaintiffs eventually acquired their surgeon information through depositions, the motion for summary judgment was ruled on in early 2016—nearly five years after the litigation had commenced. Again, the Pinnacle was FDA-cleared, so the empty chair is not nearly as obvious in those cases. But if the doctor is included in the initial state-court lawsuit, then this information could come much sooner. I have obtained hundreds of thousands of pages of Smith & Nephew documents in my state court cases, whereas the year-old MDL is just now beginning formal discovery. State court or non-MDL federal court litigation in these cases involves a lot more work in a shorter period of time, often without the support of other good attorneys like you’d have in an MDL, but you get to the good information a lot quicker. Mass torts aren’t going away anytime soon, and one reason for that is the “human laboratory.” This term was used by a surgeon I deposed in one of my metal-on-metal cases to describe how we learn about the safety of many implantable devices. Regrettably, laboratory, mechanical, and animal testing are not enough to give us a long-term insight into how safe or unsafe medical devices are. Often, the only way to truly discover the safety of a device is to track it in humans. What this means is that, as new medical technology is developed, we’ll only find out that the “latest and greatest” medical device is actually the next mass tort after people have gotten seriously injured—just like we saw with metal-on-metal hips. To better identify problematic implants earlier, a handful of nations have developed “joint registries”28 which track, in excruciating detail, the survival rates of different joint replacements. Registries can be a valuable tool in taking on both the surgeon, who might have trusted a sales representative a little too much, and the device manufacturer, who might deny that its device was bad at all. You need to learn about these registries because they will always be used against you if they don’t help prove your case. If you know what you’re looking at and how to use them, the annual reports that registries publish are great sources of information for both seeing what is showing high rates of early failure and looking at older annual reports to see what the surgeon or manufacturer knew or should have known when your client received an implant. There’s a good chance that the S&N THA plaintiffs received either an R3 Acetabular Shell with an R3 Metal Liner or a Modular Femoral Head paired with a BHR cup, and a strong likelihood that they received it sometime in or around 2009. Looking at this data, the first two entries might be what we’re looking for. Place yourself in a reasonable surgeon’s shoes: with what they had, would it be reasonable to use these devices? The revision rate in year one for the Synergy-BHR is alarmingly high, and the R3 doesn’t have enough data to develop a revision rate. The revision rate for both is very high because the sample sizes are so small: the possible revision rate for the Synergy-BHR could be anywhere from .36% to 1.39% per year, and the Synergy-R3 ranges from 0.66% to 4.75% per year! What that means is that these devices could just as easily be one of the best hip implants or one of the worst. Just like most of its metal-on-metal competitors, we now know that these devices fall squarely into the latter group. Any surgeon who bothered to look at these publicly available registries would know that this early data was not reassuring at all. That same surgeon would have to know that their use together is off-label. Is a surgeon being careful enough if he or she still used that combination of parts in or around 2009? Let’s see. Imagine confronting a surgeon with this standard and the registry data above. Should a surgeon be comfortable implanting a device that could pose such a great risk in patient, when safer alternatives were readily available? Would the patient consent if all this was explained to him or her? The answer is almost certainly “no.” As their insurer and attorney look over their shoulder, the probable response (and the truth) is: “the manufacturer/sales representative told me different!” And suddenly, two of the three legs get much sturdier. The above analysis is a quick example of the value of these published registries, but the wealth of information in each year means that a resourceful and creative attorney can enhance their advocacy through the careful use of these documents. VI. Mirror, Mirror, On the Wall: What’s the Worst Device of Them All? Nobody I know has a crystal ball that can identify the next mass tort. However, registries can help you identify some devices that are problematic and might warrant some closer investigation. How would that work? If we were going to try and pick out the “next metal-on-metal,” most of the total hip revision rates in this chart would not raise any red flags. None of these entries—save for the one metal-on-metal device, discussed below—are alarming and most of the devices have at least 7 years of data with revision rates that are well within the NICE standards (typically, a cumulative one percent per each year). 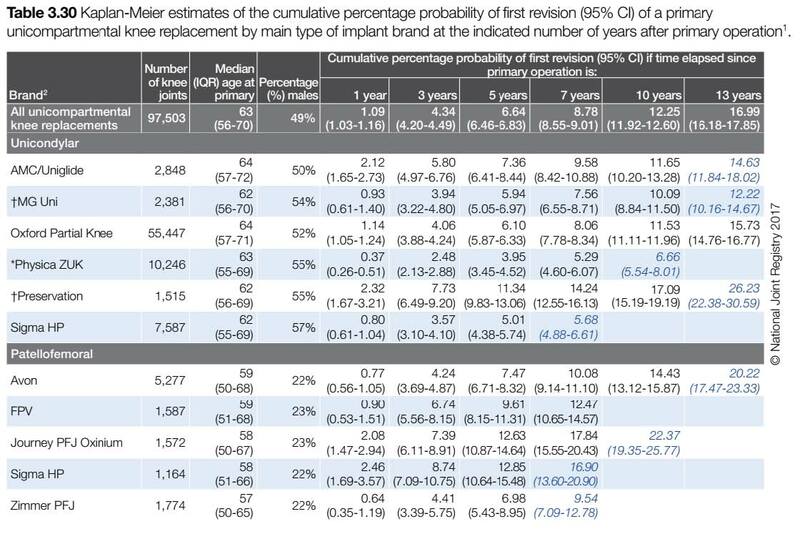 These charts show that there aren’t really any other hip implants that are failing at rates as high as metal-on-metal, so as of now, this data alone probably does not allow for prediction of a viable mass-tort here. You might need to follow the FDA recall announcements to find another way to identify the next types of cases. These are the results for some knee replacements. 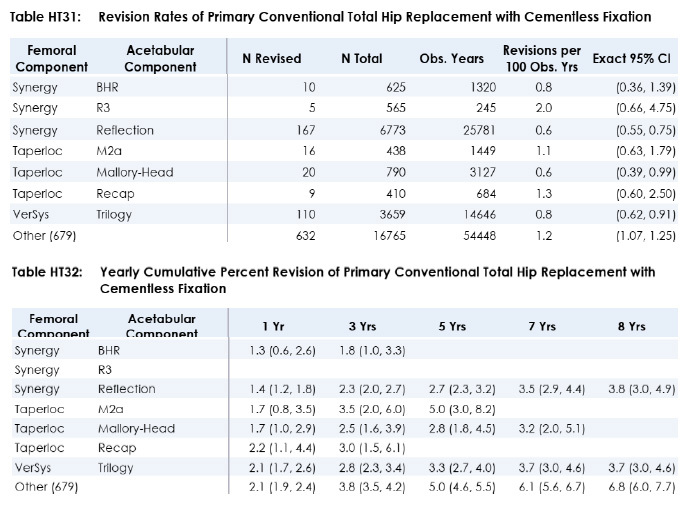 Knees probably have a higher NICE benchmark than hips, given how high the revision rates are for all of them; regardless, you can immediately pick out some implants that are still far and away worse. In particular, the Preservation, the Journey PFJ Oxinium, and (if the projection holds) the patellofemoral Sigma HP merit a closer look. The legend, which explains that the Preservation has been “discontinued/withdrawn/not implanted in last three years,”36 confirms this. This is a quick example, but it shows you how to put certain devices on your radar. It doesn’t guarantee that these products are going to be the “next big thing,” but they might help you narrow the field next time you are surveying the mass tort landscape. An MDL might be great at helping stop the already-overwhelmed court system from becoming even more weighed down by mass torts. However, its usefulness comes at a cost, especially for plaintiff’s lawyers and their clients. Between the “empty chair” problem and the longer amount of time it usually takes for justice to be served in an MDL, any advantage is useful. Seminars like this might allow us to share ideas about these cases and learn that some people are independently litigating the very cases that are in the MDLs. Hopefully, by pointing out how to avoid the “empty chair” and using joint implant registries to your advantage, I have provided some new arrows for your quiver. Good luck! Kip Petroff of Law Office of Kip Petroff in Dallas, TX is a plaintiff’s lawyer who has focused his litigation on Smith & Nephew metal-on-metal hip implants. Caio Formenti is a recent law graduate of SMU Dedman School of Law in Dallas, TX awaiting results from the 2018 July Texas Bar Examination. Witness Seminar held by the Wellcome Trust Centre for the History of Medicine at UCL London (ed. L.A. Reynolds and E.M. Tansey), Early Development of Total Hip Replacement, at xxvii (2006). Glenn Steigman (speaking on behalf of the FDA Orthopaedic Devices Branch), FDA, Orthopaedic and Rehabilitation Devices Panel transcript. August 8, 2001. Available at http://www.fda.gov/ohrms/dockets/ac/01/transcripts/3780t1.rtf (accessible via Wayback Machine). Effective Date of Requirement for Premarket Approval for Total Metal-on-Metal Semi-Constrained Hip Joint Systems, 81 Fed. Reg. 8,146-49, 8,147 (Feb. 18, 2016). Tom Craig (speaking on behalf of the Orthopaedic Surgical Manufacturers Association), FDA, Orthopaedic and Rehabilitation Devices Panel transcript. See e.g., id. for Stephen Li, Ph.D. lead panel member comments (“So the question for the design parameters is how were these actually arrived at, although it appears they just picked a range describing previous results,” “I have projected four histories just to demonstrate that although hip simulation is important and a necessary test to pass, it does not guarantee clinical success.”). National Joint Registry for England, Wales, Northern Ireland and the Isle of Man, 14th Annual Report at 45 (2017) (“NJR 2017”). These criminal proceedings were widely publicized, but a press release from Christopher J. Christie, U.S. Attorney, can be found at http://www.usdoj.gov/press/index.html. The September 27, 2007 press release is also on my website’s Legal Page under “Criminal Proceedings.” See https://www.KipPetroff.com. FDA, Orthopaedic and Rehabilitation Devices Panel Transcript, at 26. June 27-28, 2012. FDA, 24-Hour Summary: Orthopaedic and Rehabilitation Devices Panel, Day 2, at 2. June 28, 2012. 81 Fed. Reg. at 8,147. 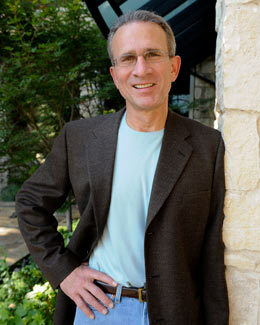 Deborah Cohen, “Hip Implants: How Safe is Metal on Metal?” 344 BMJ 18, 18 (2012). Judicial Panel on Multidistrict Litigation, “Pending MDLs by District as of August 15, 2018” (2018). Accessible at http://www.jpml.uscourts.gov/sites/jpml/files/Pending_MDL_Dockets_By_District-August-15-2018.pdf. In re: Smith & Nephew Birmingham Hip Resurfacing (BHR) Hip Implant Products Liability Litigation, 1:17-cv-00943-CCB (MDL No. 2775) (D. Md. 2017). See In re: DePuy Orthopaedics, Inc., Pinnacle Hip Implant Products Liability Litigation, 3:11-md-02244-K (N.D. Tex. 2011). In re: DePuy Orthopaedics, Inc. Pinnacle Hip Implant Products Liability Litigation, No. 3:11-MD-2244-K, 2016 WL 6268090, at *5 (N.D. Tex. Jan. 5, 2016). Chicago “Bet the Company” MDL Seminar, “What’s So Special About Smith & Nephew Metal Hip Implant Cases?” May 23, 2018. Available on my website at https://www.kippetroff.com/pdf/smith-and-nephew/reg/chicago-mdl-paper.pdf. I’ve also talked about some creative ways to investigate a device and its manufacturer before even filing suit, using things like pre-suit depositions. See Kip Petroff and Caio Formenti, “Preempting Preemption: Device Cases After Shuker—Part 1,” LAW360 (Apr. 12, 2018). Including the UK, Australia, and New Zealand. An American joint registry is in its infancy but will be an invaluable tool as its database grows. Australian Orthopaedic Association National Joint Replacement Registry, Annual Report 2009 at 76, 77 (2009). American Academy of Orthopaedic Surgeons, Guide to the Ethical Practice of Orthopaedic Surgery, “Position Statement: Off-Label Use of Medical Products,” at 125 (2013). My last Blog promised an overview of the Smith & Nephew metal hip litigation at the halfway mark of 2018. Today I will highlight some of the key litigation events that have already happened nationwide this year, and I’ll also predict what is likely to occur in this rapidly expanding litigation for the rest of 2018. There are two types of court systems in America, and there are cases filed against Smith & Nephew, regarding bad metal hip devices, in both. You have probably heard the expression, “Don’t make a Federal Case out of it!” Most people with lawsuits currently pending against Smith & Nephew are doing exactly that: filing their cases in Federal Court, apparently disregarding potentially beneficial state court alternatives. In my opinion, they are missing an opportunity. Let me explain. If you have a metal on metal hip implant case filed against Smith & Nephew, then your case most likely is in Federal Court in Baltimore, Maryland. As of yesterday’s official update, there are currently 308 BHR (resurfacing) cases and 88 THA (total hip arthroplasty) cases in the “MDL” (the official grouping of federal cases). New cases are filed weekly, and the MDL Judge continues to establish a framework for resolving the growing docket by holding monthly hearings, the next of which is tomorrow. The Agenda for tomorrow’s hearing in Baltimore contains just four entries: (1) “In Chambers Meeting”, (2) “Status of MDL filings”, (3) “Status of BHR discovery”, and (4) “Coordination and management of THA cases (including R3 cases).” Those are the same general topics that will probably be discussed in one form or another at all the remaining hearings in the MDL Court this year. * The BHR Cases. The MDL Proceedings in Baltimore began with BHR cases in early 2017, and it looks like the Court is going to push them to trial first. The Court and parties are fully engaged in defining how the BHR cases will be litigated. The BHR cases involve a relatively new “resurfacing” procedure that supposedly involves less bone loss than a traditional THA surgery. It was FDA approved for marketing to “young people who might need a revision procedure later in life.” The vast majority of BHR Plaintiffs with cases are suing because they ended up needing a revision procedure later in life. A March 26, 2018 Memorandum Opinion from the MDL Judge limited the scope of valid claims involving this procedure and product, so current discussions seek to define how Plaintiffs will be allowed to develop their cases within this limited framework. There is a tentative trial date of March 2020 for one or more of the BHR cases. No one, including the Judge, knows exactly how the first BHR case(s) will go to trial, but March 2020 in Baltimore appears to be a firm trial date – at least for now. Absent a settlement, that is apparently the soonest any BHR trial Plaintiff will see the inside of a Federal Courtroom. * The “THA” Cases. Probably one of the biggest developments of 2018 for the Smith & Nephew cases in Federal Court was the inclusion of two additional types of Smith & Nephew hip cases. Both are THA cases, meaning there is an artificial femoral component that replaces the entire tip of the natural femoral bone as well as an acetabular component similar to the one used in resurfacing. Including these in the MDL came as a surprise to people familiar with these cases, because the Panel of Judges overseeing them had earlier ruled against their inclusion. The first THA cases were included in March 2018, and there has been a steady stream of new additions since then. The Federal Court THA cases are all in the MDL in Baltimore, and that’s probably where they’ll stay for years, absent a settlement. * Smith & Nephew’s Defenses. The most recent Smith & Nephew Court filing was a weekly update that merely listed the number of THA and BHR cases pending in the MDL Court as of Monday of this week. There were three separate law firms and six separate lawyers representing Smith & Nephew on that one uncontested document. These firms comprise a team of very experienced product liability lawyers who are going to assert every reasonable defense imaginable against both the BHR and the THA cases. They will continue to assert defenses even when they lose them the first time around. For example, Smith & Nephew sought complete dismissal of all the BHR cases and lost, but I predict they will re-urge the same basic defenses at later stages of the BHR cases. The same approach will be taken with the Federal Court THA cases. There will be constant battles about dismissal of BHR and THA cases on numerous legal and factual grounds. And while Smith and Nephew will surely trim the plaintiffs’ claims in both sets of cases, I’m confident the MDL Plaintiffs will ultimately see their BHR and THA claims survive these attacks. People filing new cases against Smith & Nephew are not limited to Federal Court. There is also the State Court Option, which is what I have always strongly preferred. A few cases were filed in various state courts this year, and more are expected soon. For various reasons, there are far more cases in Federal Court than in State courts, but a brief overview of the State court cases is necessary here for the sake of completeness. The Smith & Nephew cases in State courts are primarily centered in two places – Tennessee and Texas. The Tennessee cases are in Shelby County, the U.S. home base for Smith & Nephew. In addition, I personally filed two cases in Texas courts this month. They are not drawing as much attention as their Federal counterparts, but I think they serve an important purpose in the grand scheme of things. Because of these state-filed cases, numerous depositions have already been taken and many thousands of internal company documents have been collected, perused, and carefully dissected. There may be a relatively small number of State court cases in comparison to the Federal Court cases, but their momentum shows no sign of slowing. While MDLs are notoriously sluggish due to the volume and scope, state court cases are frequently free of the burden of all that additional baggage, and that is often where the most valuable discovery takes place. So far, there have been more depositions taken in State court cases than in the MDL. There are exciting times ahead in State court litigation! Mark my words. While there have been many cases filed and large jury verdicts won against its competitors, Smith & Nephew has managed to avoid trials involving metal on metal hips implants thus far, and its MDL is still relatively new. I predict that the company’s lucky streak is coming to an end. Plaintiffs’ lawyers have them on the run in Federal and state courts. As with any new movement, it takes time and patience to organize. But now the Plaintiffs’ attorneys all have a common goal: to hold Smith & Nephew accountable for their inferior products and to provide justice for our clients who were unfortunate enough to trust a dangerous product. 2018 has been a good year for people with cases against Smith & Nephew, and the next year or so will probably be even better as we learn the inside story about how this company sold inferior metal hip products in America. I will be there asking questions of company witnesses and reading company documents, and I’ll continue to share some of that information here. If you have any questions or comments about this or any of my blogs, contact me through the online forms at KipPetroff.com. Use the Contact Form for general questions, and use the Hip Implant Questionnaire if you have specific questions about your individual hip implant situation. The year 2018 has been the most active year yet in litigation involving Smith & Nephew metal hip implant cases, and we’re only halfway! There have been a number of fascinating developments, and with the increased volume of cases, there is also an increase in misinformation. Many people, including lawyers, are still confused about which types of cases are the best ones and why. I can help clear up the confusion. In my Blogs this summer, I will share my Smith & Nephew experiences and keep readers up to date with a convenient one-stop resource for everyone, including victims of the bad devices and fellow lawyers. Public and private comments are welcome, and I will try to answer every question. Why should a hip implant victim listen to me? Because I know the time, consideration, and emotion involved in each step of the process, from having the surgery to recovery and physical therapy to the uncertainty that accompanies each discomfort afterward. I’m a former athlete with three implants myself – both knees and a full, ten piece lower back. And I’m a Plaintiff’s lawyer (meaning a victims’ advocate) representing those with Smith & Nephew metal hip complaints – and I’m one of the few lawyers actively working to develop individual cases against this company. There are only a handful of lawyers who are actively litigating these cases on an individual basis, and currently, my experiences – in both state and federal court – are the most diverse and among the most successful. I understand this company’s methods and can make reasonable predictions about what is likely to happen next. A Federal Court of Appeals ruled in my favor last year in a Smith & Nephew case, and I successfully procured almost a dozen depositions of Smith & Nephew witnesses in three other cases. And in April, I argued a Motion in the “MDL Court” in Baltimore. I covered a lot of Smith & Nephew ground in the last couple years. I am 100% committed to the litigation and to seeing this company do what is right for its consumers. SMITH & NEPHEW HIP CASES. The first thing you need to know about any medical device case is the exact brand of your implant. The laws that apply to your case will be vastly different depending on the brand and the construction. For example, a plaintiff with a device that received full FDA premarket approval or clearance will have a tougher time in court than one whose product was never FDA approved at all. Smith & Nephew has hundreds of cases filed against them involving their FDA approved hip resurfacing device, and there are dozens of cases involving two types of metal devices that did not have approval. It is easy to tell the difference, if you know what you are looking for, and it is crucial to understand this before you start investigating the possibility of a lawsuit. The product brand and its regulatory history are the most determinative factors in predicting success. If you don’t know your product, I can help. Stop right here and contact me using my online contact form, as the remainder of my blogs are written under the assumption that readers or their clients have a Smith & Nephew metal hip implant. My goal is to provide you with as much useful information as possible to help you understand your case and eventually resolve your complaint. Start by reading Chicago Bet the Company Seminar, a paper I wrote for a speech I gave to a group of lawyers in Chicago in May. Take a look around my website for other information about Smith & Nephew, including historical company documents of interest and a comprehensive time line that will put your potential case in context. And please stay tuned for my next few blogs, keeping clients and attorneys apprised of Smith & Nephew developments so far this year. I will provide updates as they occur, and will make predictions about this massive corporation’s next self-serving moves.